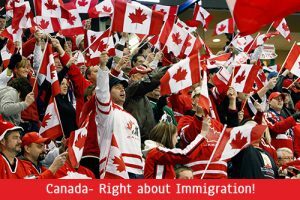 Canada and Immigration; Not Gone Wrong! In the world where everyone is in a tension to save his/ her identity in their native place, Canada has proven time in and time out that you can keep your identity on its land. The support not only comes from politicians, but the primary support comes from the people in Canada where they welcome you with open arms and not make you feel like a foreigner. One country wants to shut down Muslims from everywhere and cut down connections with Mexico. On the other hand is Canada, which can be a perfect example or even a campaign idea for World Peace. This country has become a rare exception where there is so much tolerance and virtue which is so little with some of the countries. It is a country that has not forgotten its immigrant routes and has accepted that every Canadian is a proud immigrant. Canada’s points system helps you in getting in. You acquire the points you are can step into the country. Prime Minister of Canada announced it to everyone entering their country, “This is your home.” It said because they know how immigrants will fit in and become good Canadians. So you get a secure present and future with an option of another nationality! “Diversity is Strength’ is the motto of Canadians. Canada gives you the freedom to keep your identity, religion and faith but the only thing it asks you to provide for the country is your loyalty to the country. It is a beautiful and kind country. Tolerance is Canada’s identity. Broadening its options for everyone is a welcoming situation.